Friends of Water was founded to save, filter, and celebrate water. 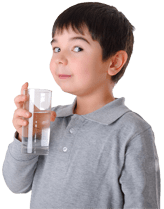 Our customers have let us know that what they are most interested in is water filtration. It’s a complex issue, and many appreciate the research we’ve done and the products we’ve selected to sell. As an independent, family-owned and -run online store, we can select sell pretty much what we choose. We choose those that work the best. We don’t choose those with the most certifications or test results! While these can be clues for people who don’t know anything about water filtration and are trying to sort it all out – tests only tell you so much. And isn’t it interesting how we all seem to have tests that show OURS are best! If you are working with ‘classic filtration’ – in which the water is filtered by running over and through filter media (and you should be) – then the more of the right filter materials you have, the more filtration you will get. This is FAR more meaningful than a ‘snapshot’ test that doesn’t say how long the filter was used, or how long the filter material will maintain those filtration levels. Friends of Water knows enough to be able to sort through the claims. But you don’t have to know too much to sort through some of them. If two manufacturers each say that their filter will last for a year – and there is twice as much filter material in one manufacturer’s than the others – well, what do you think? Tests are more meaningful when someone develops a newer technology or process, and needs to demonstrate how effective it is. But seeing the same filter material tested in every different filter it’s used in doesn’t tell you much. It either works or it doesn’t. If a company uses all filter materials that have been certified by the NSF, how much benefit is there to spending tens of thousands of dollars getting the same materials certified over and over? Yes, we show some test results, but try to keep the focus on what we consider the more important issues. We prefer to keep the costs of the filters lower so more people can benefit from naturally cleaned water. Does the filter you are considering have the right combination of filter materials to work on all the categories of contaminants? These are heavy metals, chemically-based, organic-based, taste and odor. A few contaminants need an extra cartridge so that you have enough material to remove that contaminant. These include chloramines and fluoride as the prime examples.